When a person enters their 30s…it is a wee bit confusing. As in, “Am I still a 20-something, because I FEEL like I am and I think that way?” But, at the same time, when encountered with a group or a gaggle (females) of 20-something’s, 30-something’s typically are “catty,” because those 20-something’s bother us; people in their early 30s tend to become irritated with the loud “thump-thump-thump” of the vehicle speakers and the silliness of the way those people behave. Therein lies the problem with shopping for clothing. There is not a section dedicated to people in the “not really young, but definitely not old yet,” genre. We (early 30-somethings) are not sure if we can still pull off the MTV/punk rock-look, but we do not want to start dressing like an old school teacher/librarian either. So, as a young woman, when I shop in the Junior’s department…I am annoyed because I have to go up a couple of sizes than what the TRUE size is (young women sizes are smaller than women sizes….say, a size 5 in Juniors is equal to a size 9(ish) in womens–I just made that up; please don’t fuss at me). Also, I have to go up a couple/FEW sizes when I shop in the Juniors department because I have finally developed hips (at 33 years old). So, I may be able to wear a smaller size in because of my waist, but I have to get a larger size (or sizes) because I now have hips. I am 33 and not yet ready to wear my shorts down to my knee or cover up everything with a cute, albeit modest, shirt. So, all of that to say this; I purchased the shorts below in the juniors department…of course, they were far too short for me to really love them. But, I could not find anything in women’s that was stylish and not “old lady” looking. I think we young adults need to make our voices heard. We are not young and silly anymorebut we are definitely far from being “middle-aged.” We need our own section of (affordable) clothing when we are in a department store! After wearing these shorts only a few times just as they came; I decided today to alter them a bit. 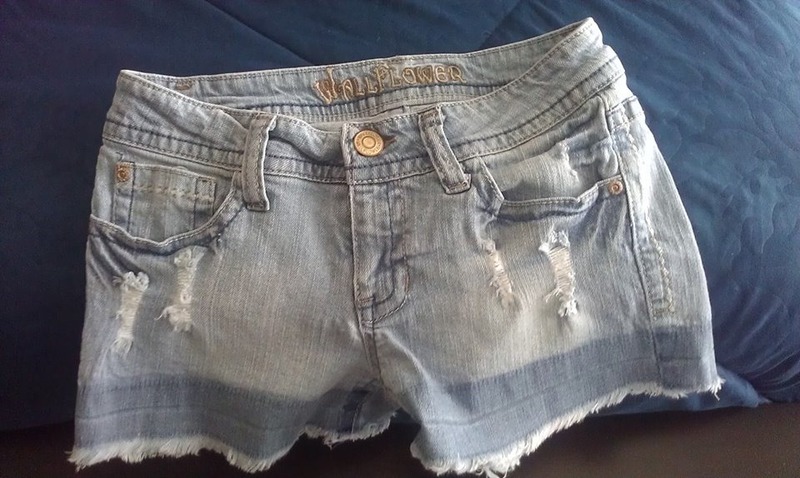 They are cut-offs, and the inseam originally was a mere 2″. I spent about an hour unraveling the thread to make the inseam be 3 1/2″. I am pleased with the way the shorts look now. In fact, I think I prefer them this way with the denim a bit darker around the edges. What are your thoughts? (TRUE) Guilt does not have an expiration date…but “guilt” does. Why does the one person that you are asking to work WITH you never believe that you will take negative action, forcing you to prove what you said would happen (especially if they vocally acknowledge but physically refuse to make the effort in order to help make things better)? As children, many are warned that they will be spanked if they do not obey their parents/parental figures. A lot of children refuse to obey, knowing that the parent is simply using a “scare tactic” to make them behave the way that is desired from the other. Relationships (of any kind) always end up going back to the “high school” mentality when an argument arises. The measure of maturity is how we choose to handle this argument; do you want to go back to “well, you said/did this first” or would you rather adhere to the rational way and admit your own fault in the argument without blaming the other person or something/someone else for your actions (or lack thereof). In life, it is our choice of how to handle things that makes us adults. Another person can not make you feel guilty, it is an emotional mind game and age does not matter; guilt will grow with you. That is, unless the guilt you feel is unfounded and just a silly teenage game someone plays to force you into feeling shameful for something that you need not feel at fault. The true test of becoming an adult is whether you will play the silly mind/emotional games you did as a child/teenager.